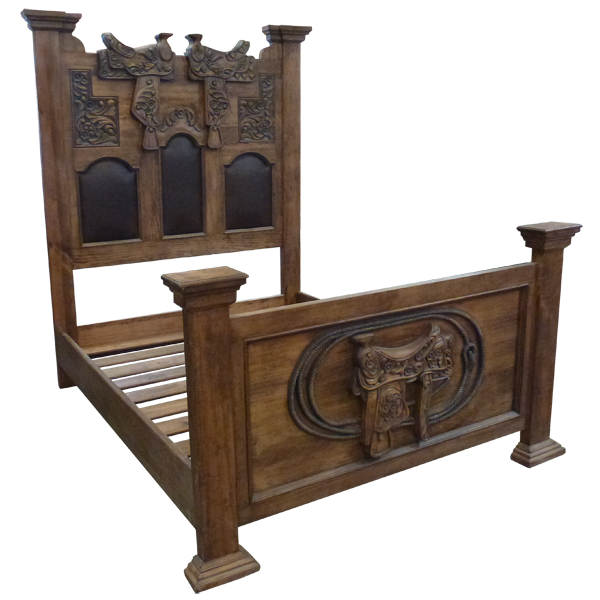 This magnificent, handcrafted, Western style bed has a fabulous finish with marvelous, hand carved designs. The antique finish on the bed is contrasted with its darkly, stained, hand carved details. 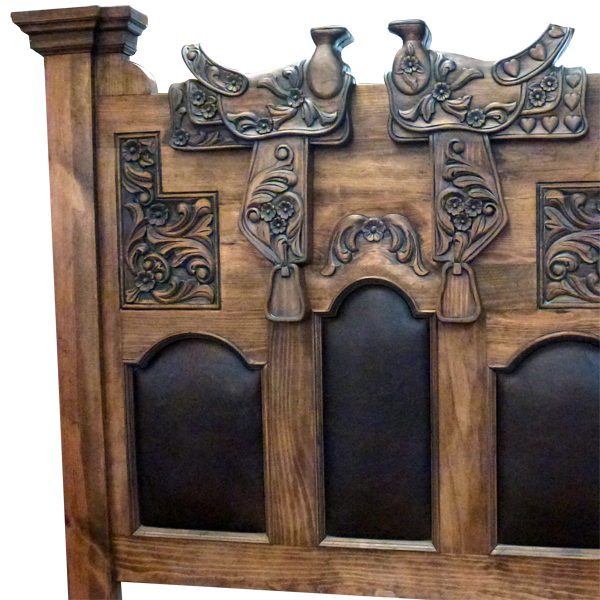 The top of the rectangular headboard is embellished with two, matching, hand carved saddles, and each saddle is adorned with amazing, hand carved, designs. Below the saddles are matching, geometric shaped, hand carved, floral designs, with a curved, hand carved, floral detail in the center. The lower front of the rectangular headboard is embellished with three, geometric, padded panels, each with an arched top. Each panel is upholstered with opulent, black, full grain leather. The headboard is framed by extended, solid wood uprights, and each upright is adorned with a top, staggered, decorative molding. 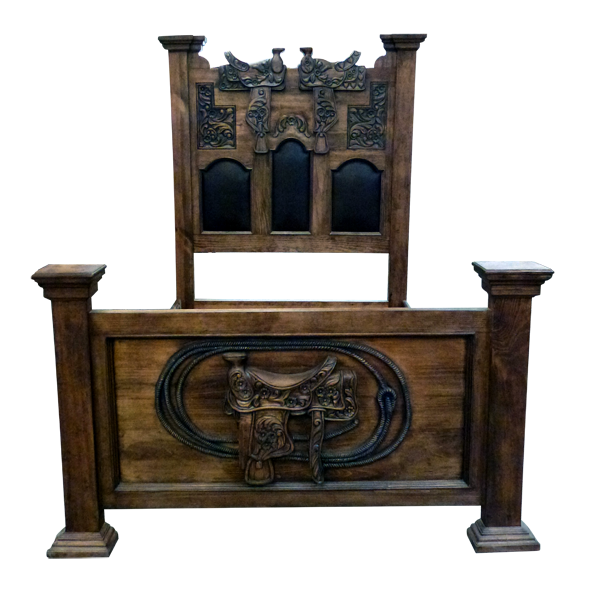 The front of the rectangular footboard is adorned with an exquisite, hand carved, Western saddle. 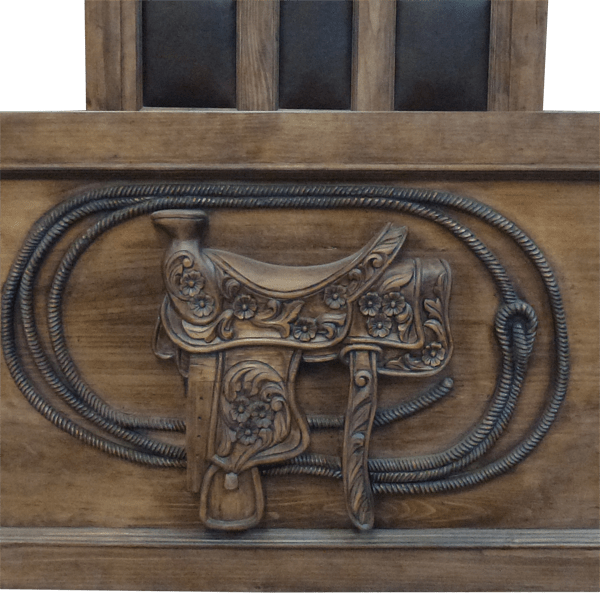 Completely encircling the saddle is an extremely realistic, hand carved lasso, and the hand carved details on the saddle and lasso are impeccable. The saddle and lasso are finished with a darker stain than the body of the bed. The footboard is framed by solid wood uprights, and it rest on staggered, square cut molding feet. It is made with the best, sustainable, solid wood available, and it is 100% customizable.